This impressive monument, dedicated by the City of New York to ITS HEROIC DEAD, and to the 148,000 soldiers enlisted for service in the Civil War, stands on “The Plateau,” or “Battle Hill” (regarding an action of the Revolutionary War-Battle of Long Island, August 27, 1776), an appropriately prominent site on Battle Avenue. 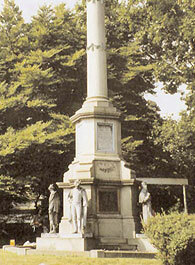 The Soldiers’ Monument, erected only four years after the end of the Civil War, was an early monument but not the first in the city. In 1866, the City of New York erected a monument at Calvary Cemetery in Queens, which has the identical four statues as Green-Wood, except that they are cast in bronze. These “public” monuments, located in two large cemeteries outside Manhattan, were fitting commemorative gestures to honor the many veterans who were in fact continuing to die in some numbers due to wounds and disease incurred during the still recent war between the states. Some of the dead were also brought home from distant battlefields. Another section of Green-Wood, not far from the Soldiers’ Monument, was donated by the Cemetery for burial of Civil War soldiers who fell in battle or died of wounds or illness as a result of Civil War service. The Hill of Graves contains the markers of men who died at Shiloh, Antietam, Gettysburg and other battlefields. “Our Drummer Boy” who served with Brooklyn’s own 13th Regiment is interred in The Soldiers Lot on the west slope of the hill. Other memorials are located in the Cemetery, dedicated to individual Civil War generals, officers and soldiers. The Soldiers’ Monument consists of a commemorative column with an ornate capital, supported by a four-sided pedestal presenting free-standing statues, bas relief plaques, plaques bearing inscriptions, and applied symbolic ornamentation. The entire structural ensemble is built of tooled and polished gray granite. The four life-size soldier statues are cast zinc, the existing four bas relief plaques are bronze, the four inscription plaques are zinc with bronze frames. Column festoons, acanthus leaves and applied stars of the capital, are all cast bronze. The four missing trophy ornaments representing the services may have been bronze or zinc. The monument stands over 35 feet in height and occupies a circular site surrounded by two low granite enclosures. The site is approached by climbing up a concrete stepped path at the intersection of Battle and Border Avenues. The granite elements of the Soldiers’ Monument are basically whole and sound. A number of stones in the enclosing wall, curb and base of the monument require resetting and minor repairs. All stone jointing throughout the entire granite structure must be raked of deteriorated mortar and inappropriate caulking, and completely repointed with uniformly finished dark gray mortar, custom mixed for use on old granite. The masonry needs detergent and water rinse cleaning throughout, with due care not to damage or bleach the original polish of the column shaft. The four dedicatory zinc plaques with bronze frames require cleaning and refinishing. Coloration and protective coating systems must be coordinated with the finishing of all other metals in the project. The anchorage and alignment of these plaques must be examined, adjusted or replaced as necessary. The four existing bronze bas relief plaques (1991 reproductions of missing originals) require manual stripping and refinishing in conjunction with other metals. The four missing ornamental trophy bas-reliefs are being researched in existing historic Green-Wood photographs to ascertain the most accurate images and form for the purpose of sculptural reproduction. It can be reasonably assumed that they represented the four branches of Army service depicted by the soldier figures: Infantry, Cavalry, Artillery and Engineers. The first phase of restoration of the Civil War Soldiers’ Monument has commenced by The Green-Wood Historic Fund, with public funding in the form of a grant through the New York City Department of Cultural Affairs. The initial work will provide replication of the four original lifesize zinc soldier statues in cast bronze. The replicas will be accurately made in durable bronze and re-installed on the monument during the summer of 2002. The original zinc sculptures will also be preserved. This second phase of restoration consists of the cleaning and repointing of the entire granite memorial structure from grade to column capital, cleaning, repair and refinishing of all existing bronze and zinc plaques and applied ornamentation in esthetic coordination with the color and finish of the new soldier figures. Additionally, it is necessary to re-create four branches of service bronze trophies to replace the missing symbolic elements on the monument. Historic photographs in the archives of Green-Wood show the form and character of the trophies. Their precise size may be ascertained from the original anchor locations and remaining soiling shadows on the monument. Further information may be required from military historical sources, i.e. the West Point Military Museum, etc., to confirm the correct symbolic content for each trophy.